At 7:00 am Sapporo station was bustling. Crowds of people shuffled around each other in an intricate weaving of human traffic. Long lines formed at each of the ticket windows, and I was relieved that I purchased by ticket two weeks in advance. After buying a bento and snacks for the long journey, I found the sign for the train departing to Wakkanai and boarded in car number 2. I took my place at t window seat, and as the seats were narrow, a trademark of earlier trains in Japan, I spread my body out across two of them and made myself comfortable. This would be my home for the next five hours. The large window frames a fantastic scene as the train eased out of the concrete landscapes of Sapporo. Slowly picked up speed and once the sky scrapers were far behind us, rolling plains of snow and distant forests took their. During the long ride, I absorbed the scenes out the train window. Grey barren trees, piles of un-melted snow from winter, rolling hills of dry brown grass, and the distant white peaks of sharp mountains. Occasionally a colorful shape would pop of the snow, usually a lone house, always fire red, golden yellow, or aqua blue. On the mainland of Japan, where houses try to mimic nature, try to live in harmony with it, it felt like the homes in Hokkaido wanted to outshine their settings. They were unnatural shapes, unnatural colors, in unnatural positions on the earth. Rather than being cradled in the fold of tiny hills, or perched along river beds, they were isolated structures　amid barren planes, interrupting the expansiveness of an open valley. After only an hour I found it difficult to stay comfortable on the train. The seat did not recline far, and although I had spread myself across two seat I couldn’t seem to settle into one position. Halfway through the journey, as we ascended up a mountain and neared Asahikawa, the small piles of snow grew until they covered the ground was wholly invisible. The trees had no even begin to bloom; it was as though we had traveled backwards from early spring to the dead of winter. I began to worry if the clothing I packed was too light for such weather. But my fear waned as the train lurched on, two hours left in its journey, and the snow began to disappear again. Green leaves from young bamboo took its place on the rolling hills, and the deep emerald of pine trees could be seen in the distance. 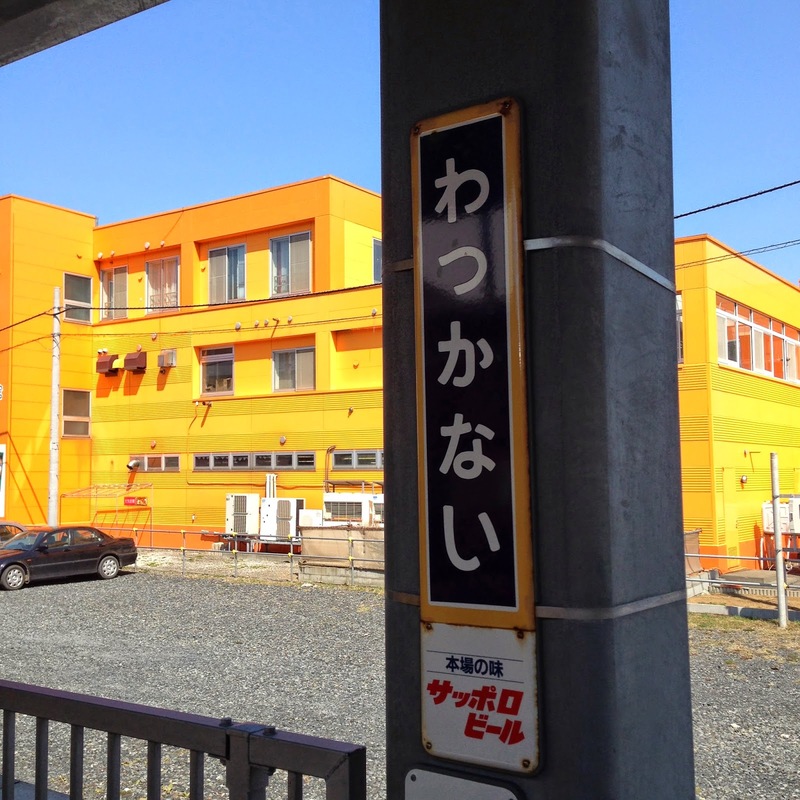 I took a snapshot of the station at Toyotomi, a tiny town bordering Wakkanai. The station was little more than a concrete podium and a white sign against a stark backdrop of dead grass and brown mountains. I prepared myself for a similar scene in Wakkanai. 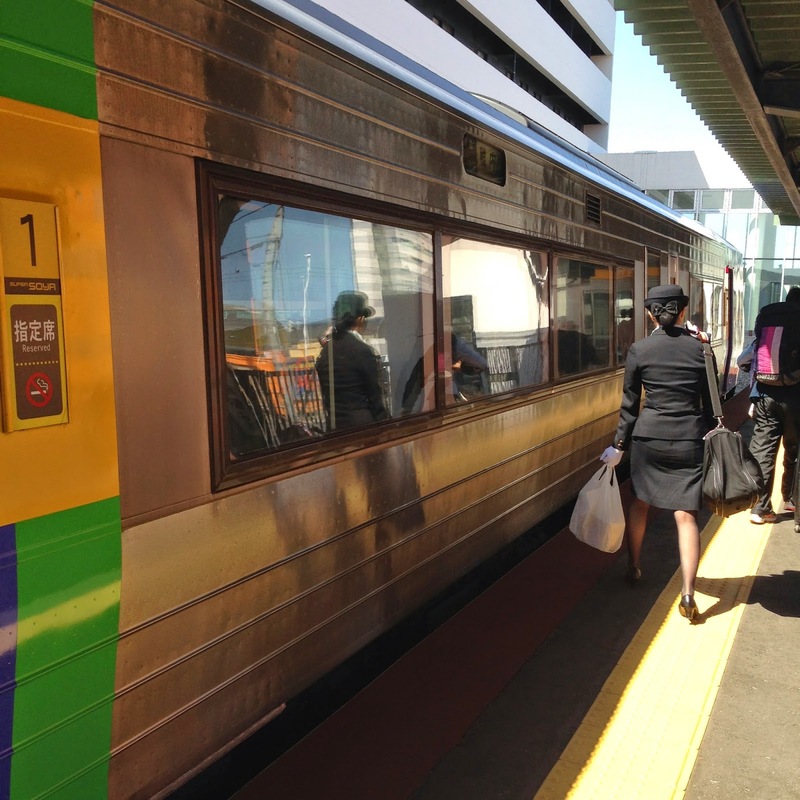 When the train screeched into the Wakkanai terminal at 1:00 pm, I disembarked from the train carriage into an open air platform, and felt the cool northern air for the first time in five hours. It was not the biting wind I had felt in Sapporo, nor that extreme cold I shuddered to touch from the train window. This was a pleasant breeze warm from the powerful sun which illuminated everything beyond the shelter of the train station. The sun only heightened the wild colors of the homes and building, though many of them were crumbling and faded, they seemed to smile in the radiant light. I had made it to the most northern city in Japan. With expectations of encountering a cold and barren refuge, I was at once enchanted with carnival of a town and its jubilant weather. A few ardent tourists had rushed off the train to photograph the station signs, showing the distance of Wakkanai from Tokyo. I wondered if I would see them again at one of the few attractions in this small northern city, but as we left the station we scattered into the city and I was alone when I reached the lobby of my hotel.